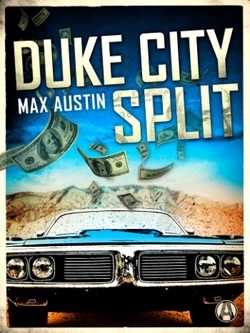 Duke City Split - Doug Grad Literary Agency, Inc.
Duke City Split by Max Austin is a terrific debut crime novel set in Albuquerque, New Mexico—Duke City. Successful bank robbers Bud Knox and Mick Wyman have only two rules. 1. Never rob a bank where you live. 2. Never do a job with anyone else. The two have been racking up a string of successful robberies for years. No one would ever suspect them of being friends, much less working together. Bud is slight, married, and the father of two young daughters. The stay-at-home-dad cover is perfect for him. Mick, on the other hand, is a bruiser, a thrill-seeker, a guy who looks right at home in a biker bar. Bud and Mick have never been caught, never even been suspected. But then the kid from the car stereo place approaches them with an easy score. A local bank branch with little security seems to be very vulnerable on Monday mornings when the armored car from the nearby Indian casino pulls in with the weekend take. When Bud and Mick case the branch, they discover that really will be as easy as the kid says. Too easy to pass up. Even though it violates Rule 1—the bank is right here in Albuquerque. And it violates Rule 2—the kid with the info wants in on the robbery, and in on the split. The robbery is a piece of cake, but when the bank guard recognizes the kid, it’s not the cops Bud and Mick have to worry about. It’s the greedy guard and his even greedier wife, who want a large cut of the take in order to keep their mouths shut. But Mick knows he’s going to have to shut them permanently. And so begins a string of murders, beatings, and mayhem as they desperately try to keep the money and stay one step ahead of everyone else. When the Chicago mob descends on the casino to get their money, that’s when the violence kicks into overdrive. For Mick, it’s all in a day’s work—this is what he lives for. But for Bud, he’s scared. Scared of losing his wife, his kids, his home, his split of the money, and his life. He’s not cut out for the rough stuff. When things come to a head at the casino—cops, mobsters, and bank robbers—Mick does everything he can to make sure that Bud can walk away from it all at the end of the day. For the big bad guy has a soft heart for the man he thinks of as his little brother.